Our friend Irv in Washington D.C. put me onto this wonderfully care-free way to roast a chicken developed by America’s Test Kitchen TV programme. It’s simple and hands-off (well, the chicken needs a hand getting into the oven but that’s about it!). Choose a pan that will hold the chicken easily. Put the empty pan in the oven–yes, empty–no oil, nothing! 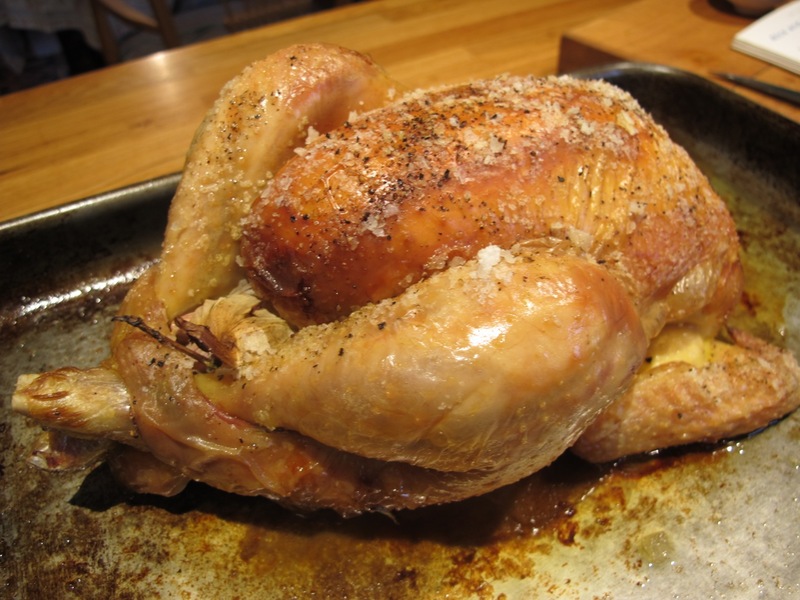 Dribble olive oil over the bird and using your clean hands or a brush, coat the chicken in olive oil. Stuff the cavity with the lemon, garlic and herbs. When the oven has reached its target heat, quickly take out the pan wearing oven gloves, pop the chicken on it and put the pan straight back in the oven. Roast the chicken for 30 minutes. Turn off the heat but DON’T open the oven door! Let the bird sit cosily in the oven for a further 30 minutes–it won’t complain.Then take the pan out of the oven and cover the chicken with foil and let it settle/rest for 15-20 minutes. 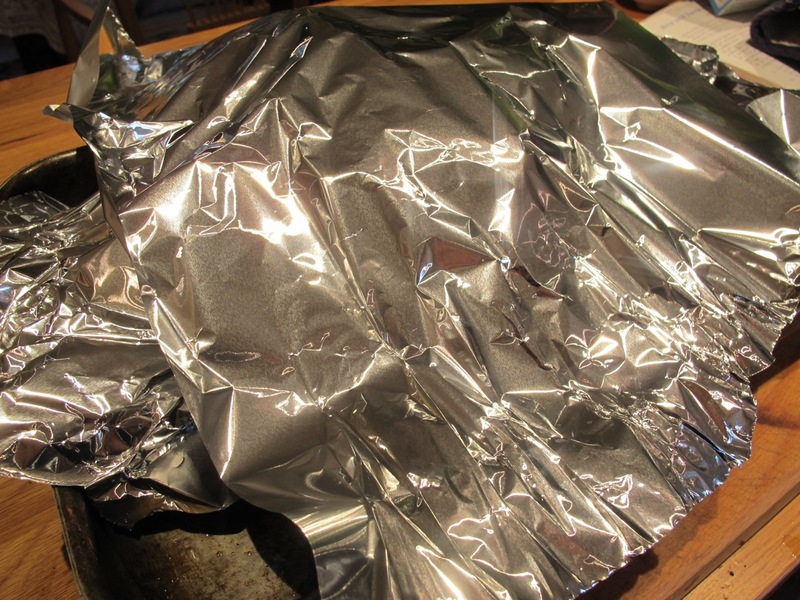 Remove the foil and transfer the chicken to a warmed serving platter. 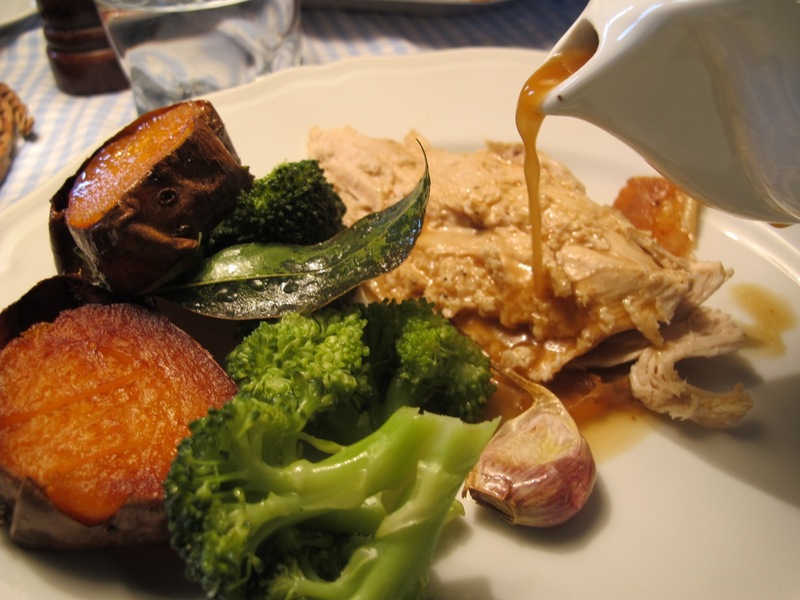 Carefully spoon out excess fat in the pan–leaving the good gravy making juices behind. Gingerly upend the chicken and let the remaining juices inside fall back into the cooking pan. Deglaze the pan with the white wine on a lowish heat–stirring as the alcohol evaporates. Pour this gravy into a heated gravy boat or jug. 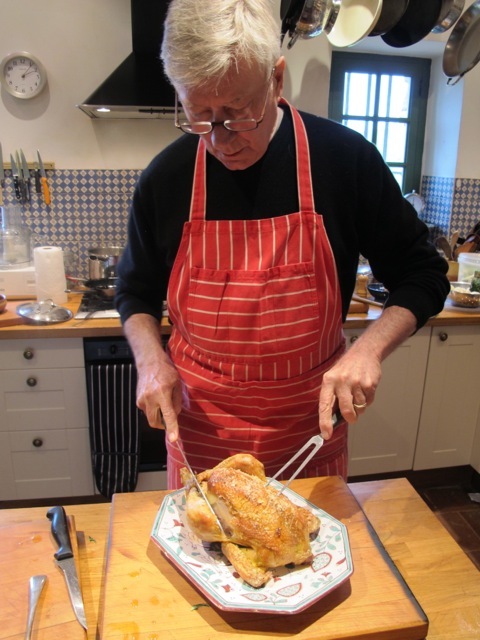 And there you have it–Irv’s simple carefree way to roast a chicken. I’ve had no lunch and you are making me sooo hungry! Printing this recipe out. I will be trying this soon! I’m getting into this heat the pan style of cooking. I have a variation on this type of recipy. I do not know the quantities. I just throw and rub LOL. Garlic Salt, rosemary, lemon juice on top of the bird. Put a sliced apple inside the chicken and cook in the oven. I have a variation of this chicken recipey. I do not know quantities of the seasoning. Put garlic salt, rosemary and lemon juice on top of the bird and rub in seasoning. Put a sliced apple in side the chicken. Roast in the oven. Looks like I know what I’ll be fixing for lunch this Thursday! I have to ask about “deglazing the pot” with white wine. Exactly what do you mean by this? I mean, I get the white wine part (I ALWAYS can handle white wine,) but have not heard that particular term…deglazing…in that connotation before. It just means gently easing the “bits” on the base of the pan that have solidified during the roasting back to liquid form for the gravy.The wine/water/stock whatever you use is the agent for this process. You have inspired me to prepare this for dinner – So easy & luscious! I cooked a (4 lb.) 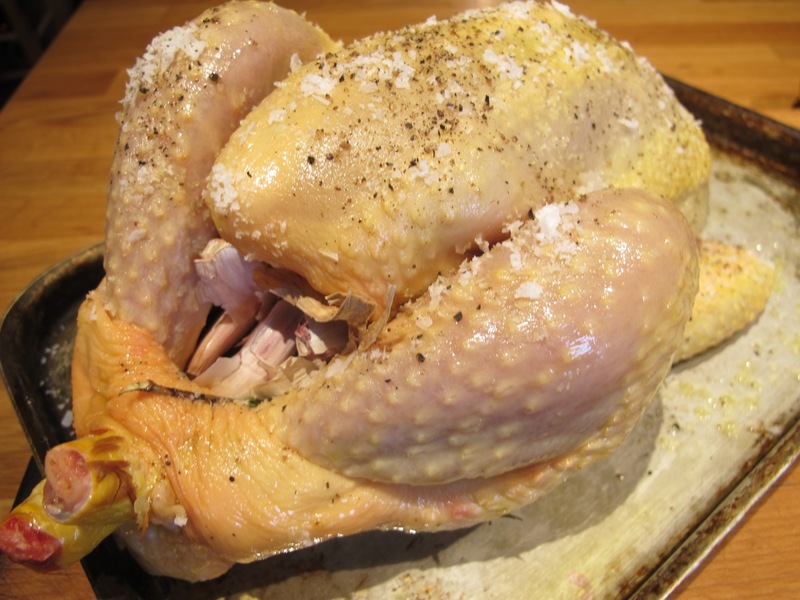 chicken using this method – it was so moist! I’ll definitely use this method in the future. Thanks for sharing! And it was good!! Yummy, yummy moist and good gravy(we did it without the wine). I wonder if your French chickens are much better tasting than our American ones? I only buy either organic or Kosher. Years ago, before people began worrying so much about salt, Kosher chickens were absolutely delicious. Now, they’re just OK. Also, if you can get a subscription to “America’s Test Kitchen” Magazine (I think it’s called “Home Cooking”) you’ll really enjoy it. It also has the most beautiful covers. Suitable for framing. Maire. I made my first roast last night and it turned out perfect. Thank you Robin for guiding me! Really glad to hear this worked Elsbeth.